The history of backgammon is long, complicated. very incomplete - and fascinating. The exact origins of the game remain unknown, though there is much conjecture, a good deal of it both ingenious and farfetched. The history of backgammon is not solved yet and probably never will be. In particular tracing the development of backgammon through the different variants of board games back to its real origins is nearly impossible. H.J. Murray states that backgamon has two ancestors: the roman Tabulae (also called Alea) and the arabian Nard or Nardschir. although there are also some board games in Asia which have similarities with backgammon, due to the long distances, it is less likely that there is a direct link between those Asian games and backgammon, than with "Tabulae" and "Nard". More likely is the dissemination via the Arabian and Mediterranean region, supported by the expansion of the Roman empire and later by the crusades. I have therefore omitted Asian games in this tabular overview. This tabular history will not explain where the name backgammon comes from. For an answer to that question have a look at the Frequently Asked Questions. Any feedback on this tabular history of backgammon by eMail is appreciated. ca. 3500 BC The game Senet, a running board game distantly related to backgammon, is played in Egypt. It is, however, doubted that backgammon developed directly from Senet, as there were no Senet boards found from the period 1500 BC to 200 AD, so there seems to be a missing link. ca. 3000 BC In Shahr-i Sokhta (literally "Burnt City"), a Bronze Age urban settlement in the southeast of today's Iran in the province of Sistan, a game very similar to backgammon is played. Findings in the "Burt City" in 2004 seem to have unearthed the oldest backgammon board. The board is rectangular and made of ebony 2) . The game was found together with 60 (!) pieces and cubic dice. Iranian archaeologists claim, that these findings are at least 200 years older than the game board found in the Royal Tombs of Ur. ca. 2600 BC Two game boards found in the Sumerian Royal Tombs of Ur by Sir Leonard Woolley in the 1920s indicate, that around 2600 - 2400 BC a board game is played that might be an early ancestor of backgammon. The game was later called Royal Game of Ur, as we don't know how it was named by the people of that time. Later boards were found that have Senet on one side and the Royal Game of Ur on the reverse. So both games were known at the same time at the same places. Very entertaining is the online playable version of the "Royal Game of Ur" at the Britsh Museum. ca. 1500 BC A board game which may be an ancestor of backgammon is played in Egypt. In the tomb of Tutankhamun, Pharaoh of Egypt, which was (re-)discovered by the British egyptologist Howard Carter 4th November 1922, board games very similar to backgammon dating around 1500 BC were found. The same boards were also found in Cyprus, which was at that time an Egyptian colony. Paintings in many Egyptian tombs display people playing the game which suggests that this game was played not only by the aristrocracy, but also by common people. ca. 8 AD First mention of the Roman game Ludus Duodecim Scriptorum ("game of twelve lines") in Ovid's 3) "Ars Amorous". Ludus Duodecim Scriptorum seems to have developed from the game Senet. It has many similarities to backgammon, amongst others a bar, six points on each side of the bar, 15 men for each player. However, it had three rows and was played with three dice. ~ 54 AD A game called Tabulae is known to have been played in old Rome. Tabulae seems to be a variant of Ludus Duodecim Scriptorum, which had developed by omitting the middle row. So Tabulae was already much closer to modern backgammon. It is said, that Roman Emperor Claudius discussed Tabulae in a book. However, none of the more than 40 books that Claudius is said to have written survived. Tabulae is also known under the name Alea (Dice). ca. 125 AD A board of Ludus Duodecim Scriptorum dated about 125 AD was later found in Holt in Denbighshire (Wales) in a grave of a Roman soldier, indicating the first spreading of the game across Europe. 300 - 500 AD First mention of the game Nardschir in the Babylonian Talmud 4) . Nardschir or Nard was played on a backgammon board, which already had two lines with 12 fields each. Each player had two dice and 15 pieces, which were arranged in the same starting configuration as in backgammon. Single pieces could be hit and had to re-enter. 476 - 481 AD An epigram mentions a position of a game of Tabulae played by the Roman Emperor Zeno (478 - 481 AD). 6th century According to the Persian poet Ferdowsi, Burzoe, a wise Iranian physician and politician, invented Nard in the 6th century. 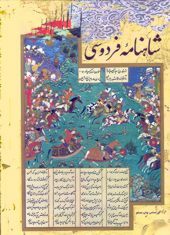 So he states in his book "Shahnameh" ("The Epic of Kings") written about 1000 AD. 11th - 15th century The crusades probably expedite the spreading of Tabulae over whole Europe. ~ 1180 First mention of tables in Germany, where it was first called Wurfzabel, in the will of Count Sibotos of Neuenberg in which he bequeaths four boards of chess and four boards of Wurfzabel. ~ 1190 Richard I 5) , king of England, later referred to as Richard the Lionheart, has severe problems with the passion for gambling of his troops. Therefore it was decreed that no one with a rank lower than knight was allowed to gamble for money. 1254 King Louis IX of France 6) , known as Saint Louis, forbids his court officials to play jeux de tables and extends this ban over other gambling games as well. 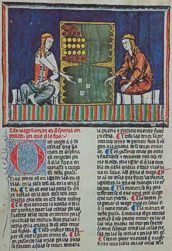 1283 Alfonso X of Castile 7) , a Spanish monarch who rules as the King of Galicia, Castile and León, completes his book "Libro de los juegos" 8) (Book of Games), which describes on 98 coloured and illustrated pages games like chess, dice and many variants of the tables family. Todas Tablas, a tables variant, is very similar to backgammon, having an identical starting position to modern backgammon and following the same rules for movement and bearoff. "Libro de los juegos" is not only one of the most important documents for researching the history of board games, it is also the first known codification of the rules. 1526 The English Cardinal Wolsey orders all backgammon boards to be burnt. Motivated by this order boards become popular which are disguised as books. Foldable in the middle, the boards look like books when folded and can be hidden in the bookshelves. 1571 In England the Elizabethan Canons of 1571 forbid playing the games of tables. Those are the last attempts to be found in England against playing the games of tables 9) . 16th century While the popularity of Tablulae seems to have faded over the last centuries, a new variant of the game called Tric-Trac spreads in Europe. Tric-Trac becomes a popular pastime at the courts of Louis XIV, Louis XV and Louis XVI so that during the French revolution, unfortunately, most Tric-Trac boards were destroyed, being seen as symbols of the monarchy. 1628 Sinking of the Swedish 64-gun ship of the line Vasa. The ship was recovered in 1961. Amongst the findings was a backgammon board that had been found in one of the officer's cabins, indicating that backgammon had found its way to Sweden. Though you have learnt to play at Baggammon, you must not forget Irish 12) , which is a more serious and solid game." H.J.R. Murray 13) states, that backgammon was invented in England in the early 17th century as a modern form of the game tables. Backgammon differs from tables by doublets now beeing played twice and the introduction of the triple game (backgammon). 1660s Francis Willughby's "Book of Games", which contains the first publication of a handwritten manuscript from England written in the 1660s, mentions the action "Vie" for the game of Ticktack (a sibling of Trictrac, which is a close relative of backgammon). This "Vie" is very similar to doubling, with the difference, that the second vie does not quadruple the stakes, but lets the player play for three times the stake. The third vie will put the stake four times as high, not eight times, as in doubling nowadays. So it seems that in the backgammon variant Ticktack a sort of doubling already existed more than 300 years ago, but must somehow have been lost, before doubling was re-invented for backgammon in the 1920s. 1678 Probably the first use of the word "backgammon" in English literature by Samuel Butler 14) in his satirical epic poem on Puritanism entitled Hudibras. 18th century Backgammon arrived in America. 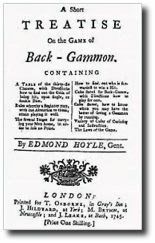 1743 First codification of the the rules of backgammon by Edmond Hoyle in A Short Treatise on the Game of Back-Gammon. ~ 1770 During the reign of Louis XVI, King of France and Navarre specially designed Tric-Trac tables become very popular in France. The tables have a cover, so that it can be used as normal table. The cover often has a chess-board at its opposite surface. And removing the cover reveals a Tric-Trac board. 1776 It is known that during the days drafting the United States Declaration of Independence, Thomas Jefferson regularly relaxed playing backgammon. In his notebook he documented the gains and losses of his playing sessions. 1842 - 1882 Probably the most famous backgammon player: Charles Darwin. He used to play backgammon daily with his wife or children at the family's residence Down House, Kent. His son writes 15) : "After dinner he played backgammon with my mother, two games being played every night; for many years a score of the games which each won was kept, and in this score he took the greatest interest. He became extremely animated over these games, bitterly lamenting his bad luck and exploding with exaggerated mock-anger at my mother's good fortune." 1920s The "doubling cube" was invented (or re-invented, see above → 1660s), probably in one of the game clubs in New York 16) . Unfortunately it is not known which genius invented the cube. There were (temporary) attempts to keep track of the status of doubling by other devices, like the one shown on the left 17) . 1931 Having identified the need for harmonized backgammon rules, the New York's Racquet and Tennis Club invites other clubs from all over America to join them in order to formulate the laws of backgammon. In a meeting on February 21, 1931, at which a number of clubs were represented, the laws of backgammon were agreed upon. The Racquet and Tennis Club was authorized to reserve a copyright to such laws. The Laws are effective as of April 17th, 1931. Those rules were published in the booklet Laws of Backgammon. 1964 Prince Alexis Obolensky organizes an international backgammon tournament in the Bahamas, probably the first international backgammon tournament. That is the hour of birth of modern backgammon tournaments. For the records: 32 players participated. Winner was Charles Wacker from the USA. 1967 The first World Championships of Backgammon are held in Las Vegas, USA. Tim Holland becomes the first World Champion of Backgammon and also wins the World Championships in 1968 and 1971. 1970 John Crawford and Oswald Jacoby, two pioneers of modern backgammon, publish The Backgammon Book. It's a classic book of backgammon. The authors were the first to try to approach backgammon in an analytical way. Also the book contains subjects you won't find in any of today's books, like the history of backgammon, etiquette, how to organize a tournament, etc. Still worth reading today, even if it can't improve your strength of play any more. 1973 Carol Crawford, wife of the well-known John Crawford, is the first woman ever to become World Champion of Backgammon. 1973 Cardinal Industries, one of the leading games manufacturers of the USA, sells in this one year as many backgammon boards as in the 20 years before all together - an indicator for the backgammon craze of that time. Another indicator for the development of the popularity of backgammon is the amount of books published over the years. 1976 Paul Magriel publishes his book Backgammon, a masterpiece of backgammon literature and rightly often called "the bible of backgammon". Still today it is a must read! Nack Ballard invents the modern backgammon variant Nackgammon. It is played with the same rules as backgammon. Only the starting position differs (see diagram). Nackgammon will lead to longer, more complex games and therefore reduces the luck factor in favour of the skill factor in backgammon. 1979 One day after winning the Backgammon World Championship, Luigi Villa (ITA) accepts the challenge to play against BKG 9.8, a backgammon programme developed by Hans Berliner. Although Villa plays much better than the programme he gets defeated 1:7. This is the first time a backgammon world champion gets defeated in an official match by computer software. The match file of that duel can be downloaded from my match archive. 19 Feb 1982 In the case Oregon vs. Tedd Barr 18) judge Stephen Walker ruled that "Backgammon is not a game of chance but a game of skill." During the four-day trial o.a. Paul Magriel acted as witness and seemes to have convinced the judge about the importance of the skill factor in backgammon. 1984 Bill Robertie publishes his book Advanced Backgammon, which was at its time a milestone of backgammon literature. A revised edition was later published 1991 in two volumes. 1989 German top backgammon player Harald Johanni starts publishing the three-monthly magazine "Das Backgammon Magazin", initially only written in German, but later bi-lingual German-English. A great source of backgammon knowledge. 1991 Dr. Gerald Tesauro develops the first backgammon software which is based upon the technology of neural networks: TD-Gammon. In the same year double World Champion Bill Robertie plays a series of 31 games against TD-Gammon and is impressed by its strength 18) . 1991 Bill Robertie and Kent Goulding start publishing the magnificent backgammon magazine "Inside Backgammon". It's published 6 times a year, later four times a year 19) . 19th Jul 1992 FIBS, the First Internet Backgammon Server, sees the light of day. The Server Software was developed by Andreas Schneider. FIBS is based on the interface protocol TELNET and has no own graphical user interface. FIBS is still online; a great place to play backgammon and meet people from all over the world. More about FIBS in my Backgammon-FAQ. 1994 With JellyFish™ the first neural network based backgammon software becomes commercially available. At this time JellyFish™ is significantly stronger than any other backgammon software. The availability of such strong software has a deep impact on the understanding of the game. 1994 The first graphical interfaces for FIBS are available, making playing on FIBS much more comfortable: FIBS/W and MacFIBS. Since this time many more graphical user interfaces for FIBS have been developed. 1998 Snowie™, developed by the Swiss Olivier Egger, replaces JellyFish™ as strongest backgammon software. Today Snowie™ is available in version 4 and is still, together with GNU Backgammon, the leading backgammon software. End of 1998 After eight years with 44 issues Bill Robertie and Kent Goulding stop publishing their magazine "Inside Backgammon"
July 1999 Kit Woolsey launches his internet backgammon magazine GammOnLine 20) . GNU Backgammon is available in its very first pre-beta version. 1998 Gary Wong had developed a neural network called "Costello", which was inspired by the works of Hans Berliner, Gerald Tesauro and Eric Groileau. In 1999 Gary Wong gets in contact with the GNU project and decides to put his network under the GNU license - GNU Backgammon is born! Since then GNU Backgammon is the child of many enthusiastic developers, who have joined the team and are working on continous improvement of GNU Backgammon. Many, many thanks to all of you! 2) I coulnd't find a picture of that board anywhere. Hints where to find more details about those findings are appreciated. Please send me an eMail if you know more about it. 3) Publius Ovidius Naso, briefly "Ovid". Roman poet. 43 BD - 17 AD. 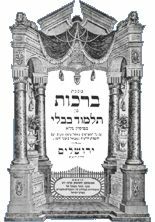 4) The Talmud was compiled between 300 and 500 AD, although additions were made for another 500 years. 5) 8 September 1157 - 6 April 1199. King of England 1189 - 1199. 6) 25 April 1214 - 25 August 1270. King of France 1226 - 1270. 8) See "Reference" for a link to the beautiful pictures of the complete book. 10) Howell started to publish his "Familiar Letters" in 1645, succeeded by a second volume in 1647, and a new edition of both, with a third volume, in 1650. A fourth was added in a collected edition which appeared in 1655. The mentioning of backgammon was in volume II, which was published 1647, in a letter to To Master G. Stone from 1935. While many histories (and the Oxford Universal Dictionary) state 1645 as the first recorded use of the word backgammon, the word was actually mentioned in the letter already 1635 and published in 1647. So 1645 is actually the wrong date! The winner of the opening roll re-rolls for his first turn. You are not allowed to close out your opponent while he has a checker on the bar. 14) Samuel Butler, 1612 - 1680, English Poet. 16) In 501 Essential Backgammon Problems Bill Robertie states: "It [the doubling cube] appeared in 1926 or 1927 in New York, probably in one of the chess and gambling clubs of the Lower East Side. (The most likely candidate location for the cube's invention was the Stuyvesant Chess Club, at the corner of the Second Avenue and 14th Street ..." Unfortunately he doesn't reveal his sources. 17) The picture was provided by Chris Bray and is published here with his kind permission. Bray bought that doubling device on ebay. There exists a photography from 1931, showing the actors Douglas Fairbanks jr. and Joan Crawford playing a session of backgammon, where this type of doubling device can be seen in the background. 19) Those games Robertie vs. TD-Gammon were published 1993 in Roberties booklet Learning from the Machine. 20) The complete set of Inside Backgammon can still be purchased from The Gammon Press. 21) GammOnLine (GoL) started with monthly issues, containing articles, quizzes, position analyses and an online match between Kit Woolsey and his readers. Since the end 2003 there are no longer monthly issues. 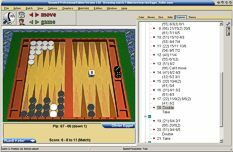 The old articles are still available, the online match is ongoing and there is a very lively backgammon forum, where a lot of top players discuss all aspects of backgammon. To access this great source of backgammon you only have to pay a member fee of 36,- US$ for a livetime membership!